Fish Cape Cod and the Islands with Bluefin Charters! The Bluefin is a 28' BHM downeast lobster boat, designed by Spencer Lincoln, and powered by a new Cummins BTA diesel engine (2018). With 10,000 lb. of displacement, a full keel, 10.5' beam, and drawing 3.5' of water, the Bluefin is smooth riding, dry, and a stable fishing platform. Although the Bluefin can take a maximum of six passengers, per USCG regulations, groups of any size can be accommodated. 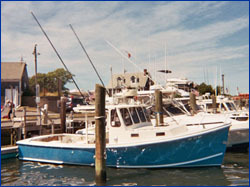 Multiple boat charters can be arranged by calling Capt. Brian Courville at 508-292-3244. Capt. Brian Courville holds a USCG 100 ton masters license, and Bluefin charters is fully licensed and insured.